Atlas Orthogonal is a specialty technique that focuses on the alignment of the head over the neck. 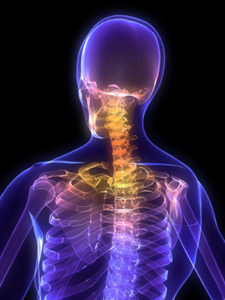 Currently, Dr. Reed is the only chiropractor in the state utilizing the Atlas Orthogonal Technique. After several years in practice Dr. Reed came to the conclusion that the upper cervical area was the most important area in the spine and if adjusted correctly could have profound effects on a person’s overall health. “I love this procedure because you take pre and post x-rays and can see changes immediately”, says Dr. Reed. How was the technique developed? Atlas Orthogonal was developed by Dr. Roy Sweat. This technique grew out of some of the other orthogonal models of upper cervical corrective techniques. After years of refinement to both the x-rays analysis and table we have arrived at where we are today. Today we have the ability to make even better spinal corrections with these new advancements which include digital x-ray analysis. How much force is used and how is it delivered? A 1.8 solenoid housed inside the head of the adjusting instrument transmits a mechanical impulse that sends a 6lb percussive sound wave force to the atlas. How can so little force move the atlas? The atlas bone only weighs two ounces and yet it is responsible for holding your head upright. By proper table positioning and knowing the exact direction the bone needs to go we can use mechanical leverage to help move it with less force. An example would be using a wheelbarrow to move a load of bricks. Little effort is needed if the bricks are transported via the wheelbarrow because it provides mechanical leverage. The accuracy of the procedure affords the patient longer lasting effects. Thus, one or two adjustments in many cases are usually all that is needed to get proven results. And while the Atlas can again lose its proper adjustment, for most patients the procedure results in far fewer visits than most other procedures. The end result is that Atlas Orthogonal provides simple, gentle and dramatic results. And that translates into greater relief, better health, fewer office visits and less money spent. Yes. It is important that certain X-rays be made. To see is to know, to not see is to guess. An Atlas Orthogonist will never guess about your health. An Atlas Orthogonist has had extensive X-ray training and will never require X-ray studies which are not vital to the diagnosis and treatment of your condition. We also have a laser aligned digital x-ray machine in house. If you feel the Atlas Orthogonal Technique or any other of our chiropractic techniques could help you, contact us to schedule your first appointment!